It's only 729 characters. We strongly recommend writing at least 1.000 characters. Use content that makes your app unique (features description, characteristics, how to use your app, ...). Your description needs to convince people to download your app. Also, be sure to add important and relevant keywords in your description to improve your iTunes app page and optimize your SEO. Your app's last version was released on April 06, 2011. It is important to regularly update your app. Best practices recommend to update your app every 4 to 6 weeks. This means fixing reported bugs, improving existing features, launching new features etc. Keep an eye on users' feedback. The next great features may already be asked by many users. All for free - no restrictions! A huge base of drinks and cocktails is at your fingertips. Now you can mix any perfect cocktail right at home. Each recipe includes an expert advice and even the history of cocktails to give you the skills of a professional bartender. 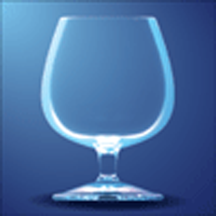 • All recipes of drinks and cocktails are stored locally on your iphone. • Add your favorite recipes to your favorite. • View all the available drinks on the single list. • Search for drinks by name, by fortress and by composition they were mixed. • History of the creation of each beverage. • Write comments for each beverage. • Determination of alcohol in your body ("Breathalyzer") - for entertainment purposes only!